Hot summer days or cold winter nights has a larger effect on people then they realize. Perspiration and chilly toes might be a sign that the weather is changing and prepare to see some changes in energy costs. When the temperature changes from mild to extreme little surprise is had when an increase in energy costs are had, however if over time an increase in energy costs keeps plaguing a homeowners utility bill it might reflect something more complex is wrong other than the trying climate. A poorly installed ventilation system could be at fault for climbing energy costs as could a home’s ventilation system that is in dire need of repair the homeowner could be spending hundreds of dollars each year on wasted cooling and heating costs. The point of a ventilation system is to provide the home with some sort of air flow as well as to prevent the air flow from leaking out into the abyss rather than keeping the air flow in the home where it belongs. The air that flows throughout the home may vary depending on the time of year; in the summer heat may filter in forcing the homeowner to turn the air conditioning on to provide the home with a comfort level that pleases all; during cooler months the need for warmth may persuade one to turn on the heat which will have an effect on the monthly energy bill. Regardless of whether the goal is to cool or heat a room the ventilation system plays the starring role in getting the job done. 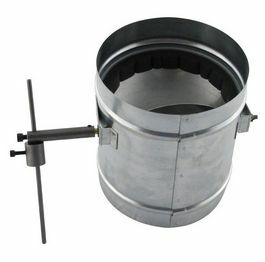 A pressure relief damper is an important aspect of the ventilation system. It is the job of the pressure relief damper to release pent up heat that may be occurring in the ducts of a home. Pent up heat or moisture can ruin the inside of the HVAC system creating more ventilation problems for the homeowner. A pressure relief damper can be set to open and release air when a pre-determined pressure amount has been set allowing the HVAC system a level of protection from the heat and moisture that could accumulate. Heat and moisture can be hazardous not only to the HVAC system but to the homeowners roof. Without the functionality that the pressure relief damper offers the trapped heat and moisture can begin to ruin the life expectancy of the home’s roof shingles and the interior ceiling. Overtime the moisture can create water spots on the ceiling of a home giving the appearance of a roof lean when in reality it is nothing more than a poorly functioning ventilation system.